It’s a perfectly normal day in the Woman’s Weekly knitting department and Knitting Design Editor, Kandy Regis, is busy preparing for her next photographic shoot. All of the designs she has on her desk today have been weeks in the making, and over the pst weeks parcels have been arriving from her team of designers. Kandy selected yarns and colours especially so that the finished items would sit perfectly together for her features. Right from the beginning of drawing the idea for a pattern to parcels of completed projects from her team of designers – all patterns have to be absolutely spot on for Woman’s Weekly readers. Everything’s packed so it’s time put your questions to Kandy at the photo shoot. What lovely patterns are you shooting today? 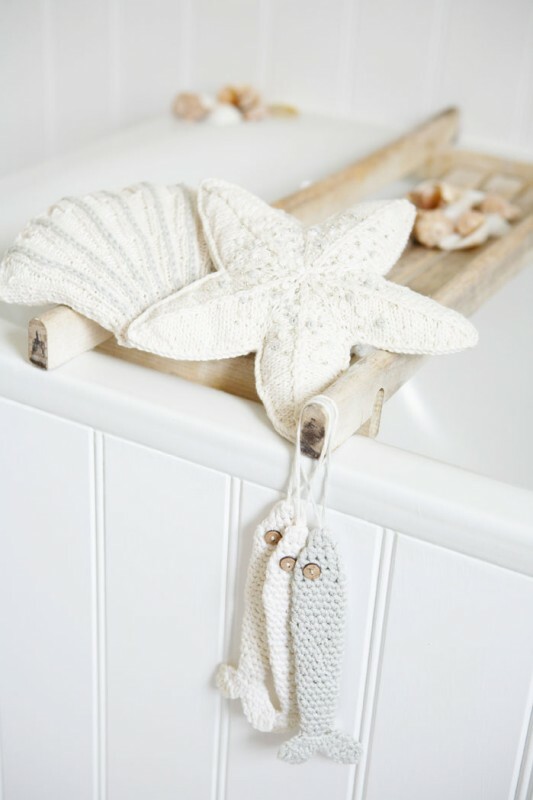 We’re taking pictures of our summery seaside story, which is the Seasonal Collection for the July 2014 Knitting and Crochet monthly magazine. The room looks very summery indeed! How have you managed to get it looking so fresh and bright? Whenever we do a shoot, it’s important that we make sure the location suits the items we have to photograph, although we often need to dress the set with a few props and make a few tweaks. Emma who helps with styling, found this fabulous boat fabric that I really like. If you look closely at the photos, you might be able to spot a few other bits too. Sounds like you’re brimming with ideas! How did this summer beach theme come to you? Inspiration can come from lots of different places. I’ve had this seaside idea on the cards ever since I started planning the issues all the way back in October. 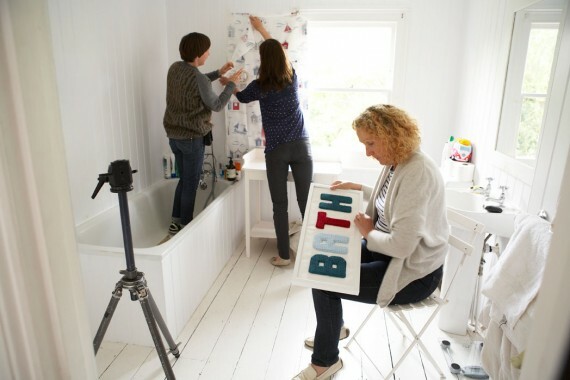 Partly it’s to do with the time of year; time for summer holidays and day trips to the beach, though, a picture postcard I have in my own bathroom of Beachy Head was a source of inspiration for the lighthouse design by Lynne Rowe that’s being photographed today. 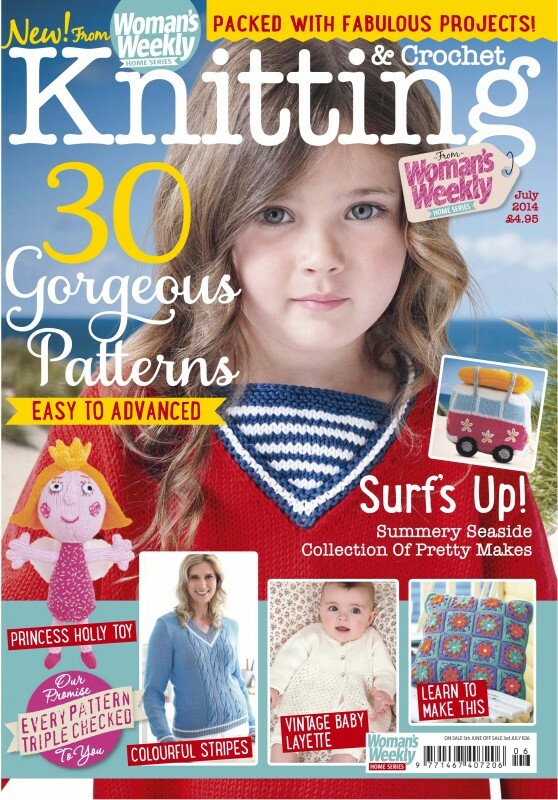 Plus I know how much the readers love to knit quirky toys so I invited designer Louise Watling to work on a fun knitted camper van as well. So it starts with an image in your mind, and then before you know it you have something ready to photograph! It must feel great to see an idea become reality? Yes, it’s very rewarding. I mean, there are lots of different elements that will affect how an idea ends up looking. We work with lots of different designers who all have their own styles and add their own little twists to a finished design. Sometimes when a project arrives in the office, it’s much better than what I’d imagined; and on rare occasions less so. But that’s what keeps me on my toes. I have to ask, Woman’s Weekly are always doing patterns for small children and dogs. How on earth do you manage to get them to sit still and look lovely for the cameras lens? It’s all in the timing and you just need to be prepared! With animals and children, their concentration span is very short and there’s not a moment to be lost. Animals are just all over the place and children get bored, so the photographer needs to be ready and as the team behind them, well we just need to assist in that. Plus we take lots of pictures! That sounds like a challenge to say the least! What do you like best in coming out to photo shoots like this? It’s brilliant bringing it all together, after the months of planning, creating the images that will be seen in print. Plus it’s great to be producing lovely images that our readers will enjoy looking at even if it’s not a particular design they wish to make, although we know most of them will want to!